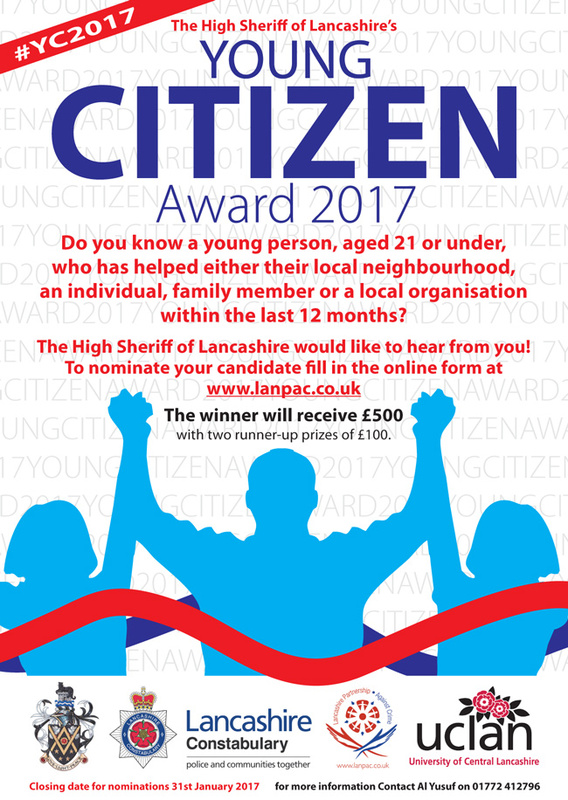 Applications for Lancashire’s Young Citizen of the Year 2017 close at the end of January. This year, High Sheriff John Barnett MBE DL wants young people to be nominated who have put others first. He said: “Some of our youngsters receive negative coverage in the media but my experience has always been that the vast majority are hardworking and help others. The awards take place every year and involve the High Sheriff inviting applications to find a young person, ideally aged up to age 21, who has helped either their local neighbourhood, an individual, family member or local organisation. Winners and runners will be selected by the High Sheriff and a panel of judges from the Lancashire Partnership Against Crime (LANPAC), Lancashire Constabulary, the University of Central Lancashire and the former High Sheriff Rodney Swarbrick, who initiated the award. The scheme is being administered by the Lancashire Partnership Against Crime (LANPAC) charity on behalf of the High Sheriff and the closing date for nominations is 31st January 2017. Application forms can be completed online at www.lanpac.co.uk. For more information you contact Al Yusuf from LANPAC on 01772 412796.